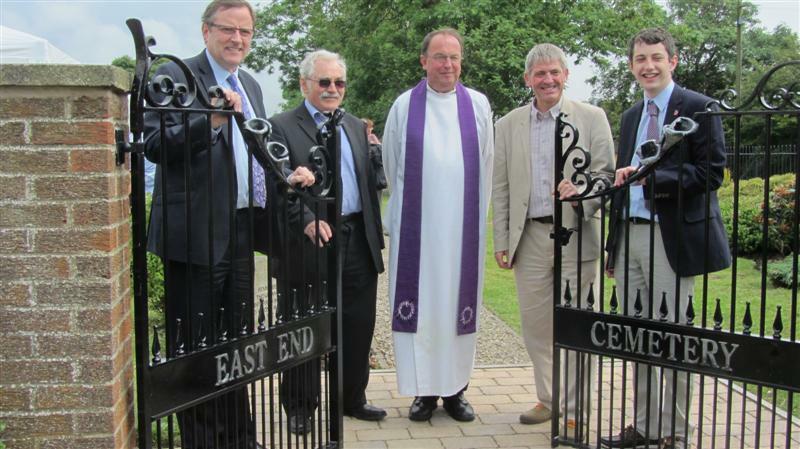 New custom designed gates were blessed on Friday 18th July 2014 by the Reverend Michael Gobbett during a service of dedication attended by over fifty local residents and dignitaries. PARISHIONERS marked the £15,000 renovation of a village cemetery with a dedication service attended by their MP, whose own father is buried there. County councillors Peter Brookes, Lucy Hovvels and Morris Nicholls contributed £12,000 to the scheme via their neighbourhood budgets. Trimdon Parish Council donated a further £3,000 and some money also came via St Mary Magdalene Church. 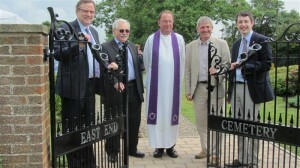 The gates were designed and made by artist blacksmith Craig Knowles and are the centrepiece of extensive renovations to St Mary Magdalene’s East End Cemetery in Trimdon Village. The project was financed by grants from County Councillors Peter Brookes and Lucy Hovvels’s Neighbourhood Budget, St Mary Magdalene Church, East Durham Rural Corridor AAP and Trimdon Parish Council. Trimdon and Thornley County Councillor, Peter Brookes spoke of his delight at the project’s success: “The new cemetery gates are a real focal point for Trimdon and their simple, tasteful design is a fitting entrance to such a treasured local amenity”. The cemetery was consecrated in the 1820s, but burials ended in the 1960s. The cemetery was rededicated in 1991 for the internment of cremated remains and has been maintained by volunteers from the Church Maintenance Team ever since. The recent renovations have seen refurbishment of the exterior wall, new paving, clearance of overgrown areas and the securing of damaged and tilting monuments. The majority of the project has been carried out by volunteers. The service of dedication was followed by refreshments and speeches of thanks from both Adam Luke and County Councillor Peter Brookes.